Wow, thanks for the ref to your favorite 'BM' spot. can anyone enlighten me on what the 'head cheese' like item is? regarding Maggi, be aware that there are different versions of this sauce, depending on where they're made. All are a vegetable extract of some sort and quite salty and could IMO be replaced with a very good soy sauce if you don't have Maggi handy. They changed the bottle design now. It's also great in soups, I actually should use it more. Originally developed in Switzerland the company was founded in Germany, where it still resides today. how delisious does all this look? I'm forming my plans for two different Banh Mi. I'll be doing a roast pork belly version with chicken liver pate and the requisite pickled daikon and carrot, but I'll probably change the pickling liquid a bit. Then I plan on a red-cooked pork belly for Banh Mi #2, but no pate and maybe some mayo on that one. I'm thinking of some French influence in the red-cooked pork version. Anyone out there have good techniques for crisping the skin on pork belly? One time I roasted a pork belly with skin/rind on and it came out as tough as plywood. The next time, I cut off the outer layer of skin/rind and left the fat layer. The fat layer of skin got sort of crispy, but not like what I've had from roast pork belly out of a Chinese deli. I found a Banh Mi recipe using roast pork belly that calls for pricking the rind/skin with a skewer before roasting, then at the last stages of roasting you turn up the broiler to puff and crisp the skin. The photo of the finished roast pork belly showed a lot of little crispy bubbles on the skin, just like from the deli. Any thoughts? 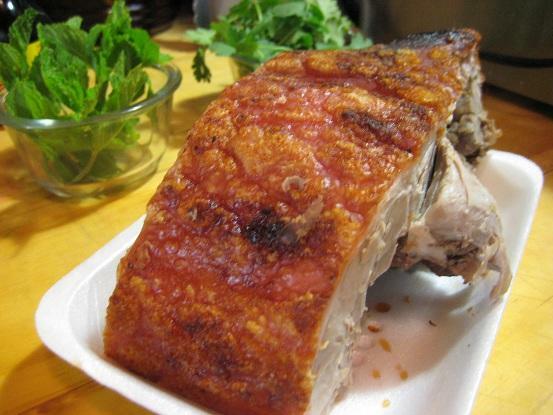 I want the pork in my "Banh Mi" nuber one to have crispy skin. David - not sure where to start looking - but there is a whole topic on crispy pork skin somewhere in eG. I've made Bahn Mi at home several times recently - although it is probably more correctly considered as Bahn Mi inspired: Lemongrass chicken (thin-sliced chicken breast or boneless/skinless thighs, marinated in lemongrass, fish sauce, sugar & garlic, then grilled), quick-pickled veg (carrots, radish, cuke usually), sriracha mayo & cilantro. Don't know that it is all that authentic, but it is certainly yummy! 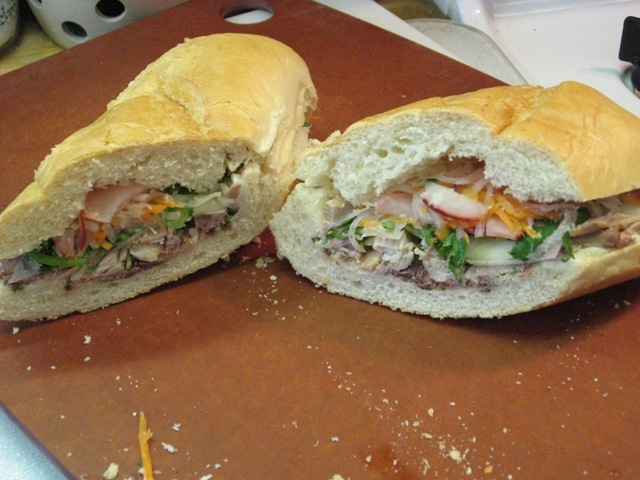 There is a little Vietnamese eatery down the street from me that serves Bahn Mi in three varieties - classic, with pate & cold cuts; grilled pork or grilled beef are the other options. There are a few topics but I think this one is the one you are thinking of. Excellent info and pictures. I make this non-traditional version all the time. it's a really good, quick (even if it's better when the meat marinates for a while) substitute. I usually make homemade sourdough ( I know it's not traditional, but it's the bread I most often make and it's a much better choice than the saltless Tuscan bread available to me.) I never use the mayo since I don't get why it's even there but that's probably because I dislike mayo. And I rarely make pate. 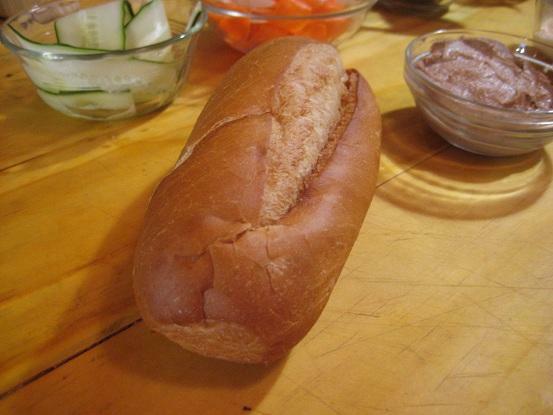 Anyone ever tried a Banh Mi with fruit substituting for the traditional pickled carrot and daikon mix? rotuts: Will have to check out Chinatown next time we are down. Great tip. LindaK: something will have to be invented...a vacuum/static electricity charged crumb catcher...Fat Guy will have to get on it with his Quirky friends. Sometimes a napkin just isn't enough. I think the Crumbs are a Badge of Honor! The Best roast pork buns to me and ive tried them all is on Oxford Place called of all things: Eldo Cake House or sometihng similar: on the E side of the street. take the L off beech. love to see what you think! Thanks for the link. 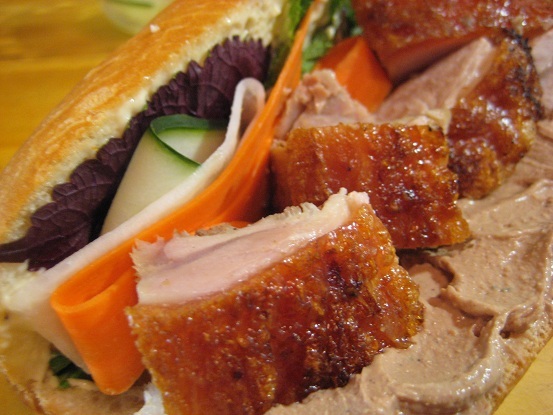 I'm going to use that style of roast pork in a Banh Mi with a smooth chicken liver pate. I'll be doing another one with red-cooked pork and pickled watermelon instead of vegetables. 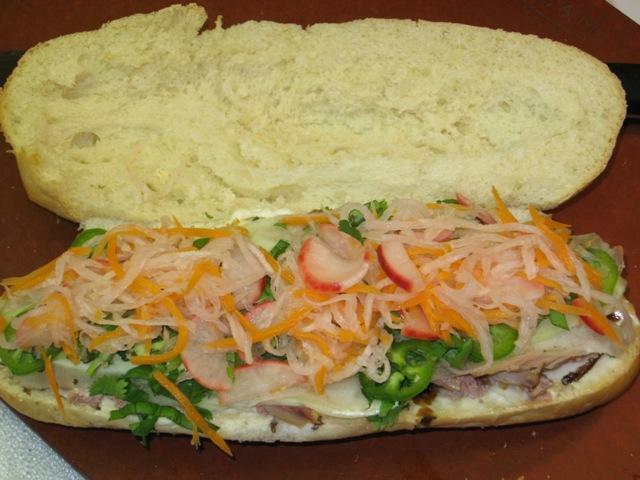 Now that's going to be a really red Banh Mi! OK, I think I'm set. How does this sound? Kenji uses a secondary rub consisting mainly of baking powder. Apparently the effect is similar to using lye in the aforementioned thread. Younger son requested char siu banh mi for his birthday. Who am I to say no? We followed Andrea Nguyen’s recipes from Into the Vietnamese Kitchen, except for charcoal-grilling the pork. We made the daikon-carrot pickle yesterday, and started marinating the pork this morning. Served on hollowed-out baguettes. Fixings included liver pate, daikon-carrot pickle, cucumber strips, thinly-sliced jalapenos, cilantro, Maggi, and mayonnaise. Yesterday I went to the Asian grocery store to buy the bread, pork belly and Maggi for my Banh Mi. The clerks have come to recognize me as a regular customer and so they welcome me and are happy to give me advice. The woman who was at check-out saw what I was buying and went into a short lesson on how she prepares Banh Mi. 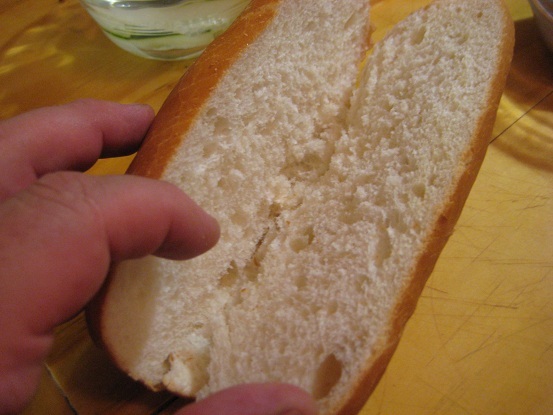 (I actually only caught about half of what she told me, so I'll serve as the interpreter here and describe her method).She said she splits the bread nearly in half, being careful to not cut all the way through, (so it is facing up like a lobster roll). She then adds roast pork, (made from a Chinese deli in Seattle and shipped fresh to Spokane), then drizzles on a little hoisin sauce. (Hoisin makes sense, a sort of sweet and sour flavored sauce). Then some fresh herbs. She didn't say what type of herb or greens, but she pointed to the spearmint, purple Thai basil and cilantro I had in my basket. C. Sap: That looks beautiful. I have made Andrea's Char Siu in the oven, but never thought to grill it. How long did you marinate it before grilling? And then you dipped or basted every ten minutes? Did you have the meat over direct heat the whole time grilling? David – thank you! I look forward to seeing your banh mi. Thanks, Katie. I marinated the meat before work, so probably about 10 hours. I did have the meat directly over the coals. The grill was pretty hot, so I dipped the meat every 5 minutes or so. Next time I will let the coals burn down a bit further, and probably make more marinade so I can dip the meat more frequently. I do prefer char siu over fire rather than under the broiler. Well, I think my first attempt at a Banh Mi sandwich was fairly admirable. A few mis-steps along the way, like buying what I thought was purple Thai basil—only to find out it was something quite different—and quite wonderful. 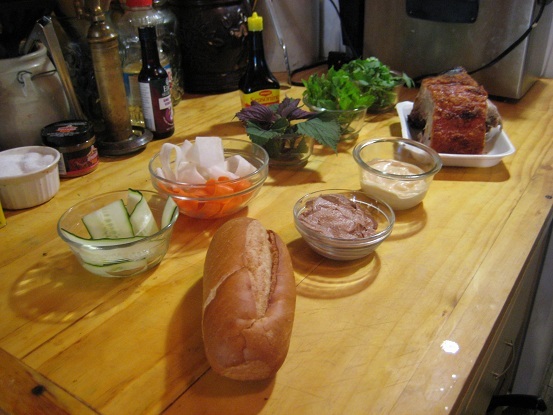 Here is the step-by-step photos of the making of my Banh Mi, from the top layer on down. (I don’t know if the layering of the ingredients in a specific order makes a difference, but I was intentionally layering the flavors and textures to, I hoped, create the best Banh Mi I could). I bought the bread rolls at the local Asian grocery store. 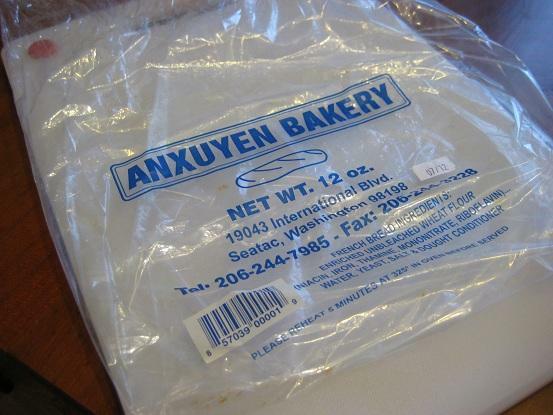 The bread is delivered fresh from a Vietnamese bakery in Seattle. It felt a little soft right out of the bag, so I let the rolls sit on the counter for about 6 hours to crisp-up the crust. O.K., I’m a sucker for homemade mayonnaise in a sandwich. But I sort of kept it within the vast region of Southeast Asia with the addition of some sriracha. (And a few drops of Asian-style Maggi). 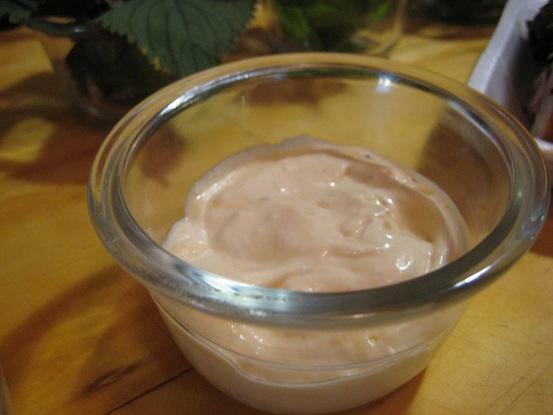 I went too light on the sriracha so I’ll stir in a few more spoonfuls for the next Banh Mi. The licorice, mint, spice and fragrant notes of basil, mint and cilantro seem like a natural pairing to counter some of the richer flavors in the sandwich—but I found a few surprises when I was facing the produce section of the market. 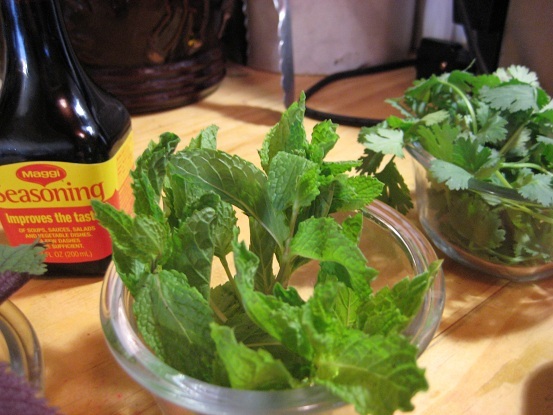 There were 4 different varieties of mint, including both peppermint and spearmint. I thought peppermint might be too minty, and I was worried that spearmint might also be too strong, but casting away from tradition I took the spearmint. Now what I thought was a bag of fresh purple Thai basil turned out to be anything but. When I got home and opened the bag, I tore into a leaf to taste it. The leaves weren’t shiny like basil, more textured in fact. It had subtle notes of licorice like basil, but it had an exotic, floral fragrance with notes of pepper and spice. 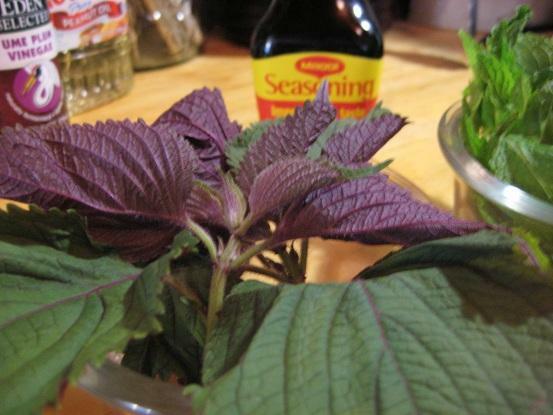 And then I found out what was in the bag, purple perilla, noted as “one of the favorite herbs in the Vietnamese culinary palette,” according to the Viet World Kitchen site. I had bought a bag of herbs that I mistook for basil, yet ended up with a Vietnamese herb, for a Vietnamese Banh Mi. One is sometimes lucky in this world of culinary discovery. A scan of Banh Mi recipes called for a mix of shredded carrot and daikon steeped in a pickling liquid. Such things always create a bit of anxiety on my part as I’ve never been a successful pickler. I chose a recipe that called for making a hot pickling brine, then letting it cool and adding in finely shredded carrot and daikon and letting the pickling take place overnight. I followed the recipe to a “t,” but then this morning when I checked on the pickled mix, my pickling horrors were realized. The brine had basically sucked the life out of my hours of shredding efforts. The carrots and daikon were limp and sad looking. I knew the pork belly would be the biggest challenge in crafting a Banh Mi, and trust me please, I had every intention of roasting my own pork belly. That it until I saw a beauty of a roasted Chinese-style pork belly sitting in the cold case at the market. Delivered fresh after a hop over the mountains from Seattle, this little piggy did go to the market. I poked the little devil through his thin layer of plastic wrap and the skin, all golden and burbly, was crisp to the touch. I just knew I had to take this pork belly home. Why make it at home when you can buy a better product crafted by chefs who have been roasting pork for years? I covered the pork belly in foil and heated it in a 350 oven for about 30 minutes, then another 2-3 minutes under the broiler to re-crisp the skin. I stole a bite of the pork belly as I was making the Banh Mi and I was glad I bought it at the store. 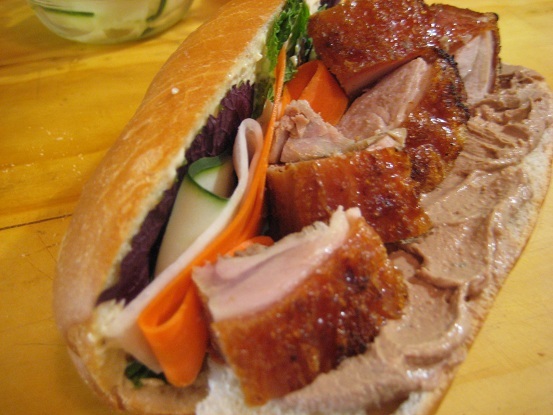 It reminded me of the flavors of Chinese roast duck, (another idea for a Banh Mi), with just a hint of five-spice powder. All I could find in the Asian grocery store was some pork pate stuffed into a little can. 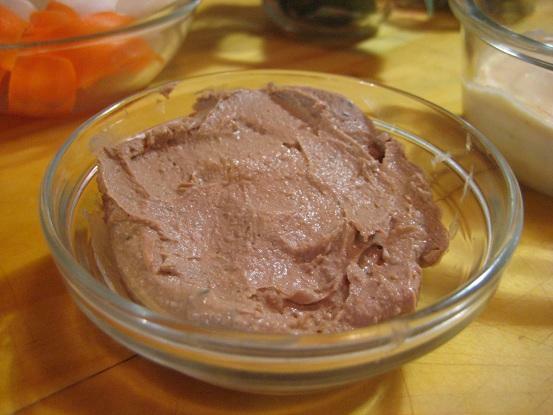 I didn’t think I could trust it, and I had a new recipe for a chicken liver pate, (a mousse really), that I thought would work quite well. Playing on the theme of marrying French and Vietnamese cuisines, the mousse was a traditional French preparation that included chicken livers sautéed in butter and shallots, then a flambé with brandy. Then more butter, (a lot of butter actually), thyme and cream. It was lush, silky, liver-rich and one of the three decadent elements of my Banh Mi, (the other two being roasted pork belly and sriracha mayonnaise). Congratulations on your first bahn mi. It looks very tasty, but also very American. Too much, too big. Think French style, not NYC deli style. Much less pate. Thin slices of meat. Heavier on the salad than the meat. Sliver your veggies for pickles instead of using thick slices. And It looks like you're missing fresh jalapenos (not sriracha, please). Did you use cilantro? that's key for this sandwich. See Bruce's pic above, he's got the ratio right. Keep at it, it will be a tasty journey. Enjoy the crumbs! Due to the harmonious convergence of this eG cook-off, and my having checked Andrea Nguyen’s “Into the Vietnamese Kitchen” out of the library a week or so ago, I decided to take the banh mi plunge as well. Earlier this week, I’d made Nguyen’s “garlic roasted chicken” using chicken parts I’d had in the freezer for a while. 2 thighs, 2 drumsticks and a breast. That recipe was a dead-bang winner, but left solitary eater me with leftover chicken up the you-know-what. Before the book went back to the library yesterday, I copied out her recipe for banh mi and also for a spicy chicken salad with cabbage that will kill the last of the garlic roast chicken. As Bruce (C. sapidus) noted upstream, Nguyen’s banh mi recipe also gives you the recipe for the daikon/carrot pickle, which I also followed (with a minor tweak…..). Verdict ! Another dead-bang winner !!! Boy was this a mouthful of yummy. I used “French” rolls from a local “gourmet/organic” grocery store (Sprouts, for those of you in the southwest). Following Nguyen’s suggestions, I hollowed out the bready part of the roll, and tossed it into the oven at 325° for about 5 minutes to crisp up. I took it out when I could smell toasty bread. Bottom layer was Best Foods mayo, drizzled with a copious amount of Maggi. Followed by schmears of an “herbed” liver sausage from the same grocery store. Then the shredded roast garlic chicken. For this I used the remaining dark meat, after having stripped off the skin. 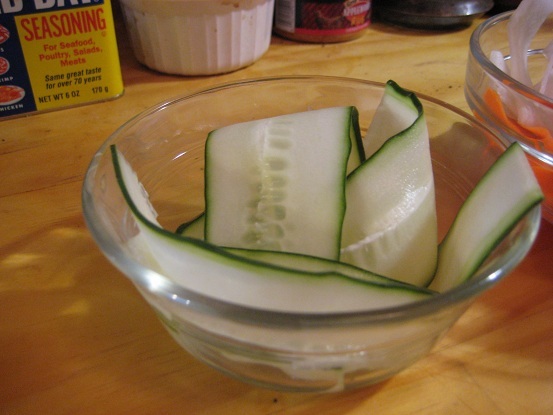 Then ribbons of cucumber that I shaved off with my veggie peeler. Then very, very thinly sliced jalapeños, seeds and all. Then herbs. Nguyen suggests only cilantro, which I certainly used. But I also mixed a couple of leaves of mint with a couple of leaves of “normal” basil, and shredded them finely. I used more cilantro than the mint/basil mix, but I liked the addition of that, and will keep it in future renditions. Then the pickle. 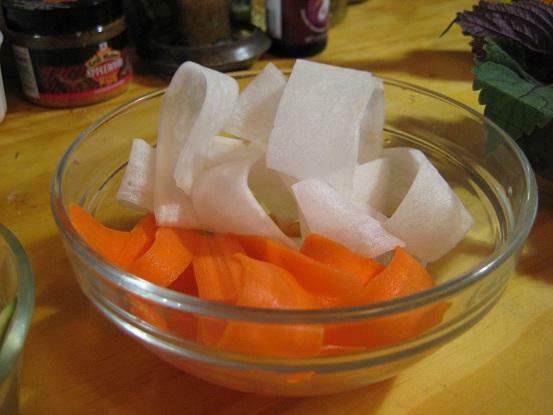 I’d taken my julienne cutter (looks like a veggie peeler, only has a julienne blade) and cut thin strips of both a carrot and a daikon. I had a handful of red radishes I needed to use, so I just sliced them into thin half-moons and threw them into the mix. Toss around with sugar and salt for a bit to wilt, rinse and drain, then cover with white vinegar mixed with more sugar and water, and let mellow for at least an hour before you use it. I’m sure it’ll taste better after sitting in the fridge for a day or so, but it was still pretty good after only a couple of hours.